Now I touched briefly on how the 10th Mississippi Volunteer Infantry was formed here. Now, now, don't y'all go running off to chase that link as I linked to that post yesterday. But if you did anyway, thanks. Now, where was I? Oh yes, the 10th Mississippi . I'm not sure who suggested we take on that identity. May have been Robin, he was one of the "intellectuals" of our merry band, in other words, he was pretty good at spelling and had a wealth of Civil War (WBtS or WoNA if'n you prefer) knowledge. I doubt it was Nute, Freiheit, or Your Humble Scribe, we weren't all that caring about what we called ourselves. Might have been Zulu, he was a studious fellow who knew lots of stuff. At any rate, we became the 10th Mississippi Volunteer Infantry, probably to distinguish ourselves from the 10th Mississippi Infantry, said regiment having actually existed in two different instantiations during the war, but who fought in the Western Theater. As we intended to stay in the East (we were all working men by then but weren't exactly raking in the cash, so extensive travel was unaffordable) we added "Volunteer" into the name. Why not a Virginia regiment you might ask? Well, we didn't think we'd actually run into any actual Mississippians up our way and we didn't want any awkward, "Whar in Virginny you boys from, anyways?" questions being asked. Of course, as soon as any of us opened our mouths any self-respecting Southerner would know we were damyankees. But, we were all from Southern Vermont, so close enough. One day while searching through my Dad's closet for wool clothing, he'd said go and look, there's a lot of old stuff in there that he didn't wear anymore, I found an old suit. A light bluish-gray it was. Pants were all wrong but the jacket, with a little work, would do just fine. I asked Dad if I could have it, telling him that I'd be modifying it to look like a 1860s era uniform and it would never be the same again. He hesitated a bit, as I recall, seems that it was the suit he was wearing when he married Mom, as near as I can recollect. But he gave his consent, as he said that the odds of him ever wearing that suit again were slim to none. So the scissors came out, buttons were swapped (a modern day maven of historicity would no doubt look askance at what I used, simple brass-looking buttons which would easily pass the "10 foot rule" cited by Andrew in the comments the other day), and stripes made of dark blue felt were affixed to the sleeves. A most respectable effort I thought, and the common soldiery of the 10th Mississippi concurred. Now I had a real nice slouch hat in light gray, which I'd "liberated" from somewhere (probably at a gathering where too many adult beverages made from hops and barley had been consumed), but I still needed a pair of wool trousers. Which I found in an outdoor clothing shop. Unfortunately, they were a really dark shade of green, not dark enough to be blackish looking, but a really deep green, like pines on a distant hillside in winter green. It might have been the cap'n, Steve, who said they should be fine. "If anyone complains, tell 'em your daddy had fought with the Bavarian jägers back in the old country." Which was a fine idea, no one ever questioned the trousers though, which was fine by me. All kitted up we didn't look too bad. We would've passed Andrew's 10 foot rule just fine. Probably even pass a 5 foot rule if you kinda squinted and were facing the sun. Our first action, as near as I can recall, was during the Great Invasion of the North in the early 1970s when we seized that fort on the Connecticut River near Charlestown, New Hampshire (here, a repeat of the link above, in case you didn't want to scroll to it). Now as the North mustered their resources the 10th Mississippi was gradually driven out of Vermont and down to near Merrimack, New Hampshire. We were fighting our way to the coast near Gloucester in hopes that the long-since-vanished Confederate Navy might evacuate us. Coming to the Merrimack River, we halted for the day. As night fell, the 10th Mississippi had rendezvoused with a number of other Confederate regiments, also making their way to the coast. The generals held a powwow and it was decided that here, on the Merrimack, we'd make our stand. The hope was that we could give the pursuing Army of the Merrimack a bloody nose forcing them to cease their pursuit long enough for the last army of the Confederacy to withdraw with honor intact. As the sun rose on a misty morning, I had the boys fall in and reported to the captain that we were all present and accounted for. After a quick look-see to ensure that we had all our gear and were ready for battle, the captain drew his sword. Across the field I could see a Yankee battery unlimbering, directly to our front. As there was no plan to maneuver to either flank, we just had to press on and hope for the best. Maybe if we could get on 'em fast enough, we'd not suffer much. We were a little nervous as we had a forest at our backs and artillery to our front. Our most fervent hope was that the much bigger regiment on our left would draw the Union's fire. The advance was called and we stepped off. Sure enough, that Yankee gun opened up on the Virginians to our left, they suffered much, but after the second round of fire, we came up on the gunners out of the mist and smoke. They were in the middle of reloading and had no chance, a couple managed to run off, the rest were shot and bayoneted where they stood. One of our boys went down when a big Yankee sergeant caved his head in with a handspike. The captain did for that big fellow with his sword, after which he raised his hand and ordered us to halt and reload, "Right quickly boys, there's more blue-bellies and it looks like they mean to recapture this here gun!" I reloaded fast then noticed the dead Yank at my feet, rolling him over as to assess what manner of goodies he might have on his person, I realized I knew the fellow from before the war. Fancy that, hadn't seen him in years, only to meet up again on a battlefield. Of course, he was deader than a door nail. Yeah, I knew him, but I still relieved his corpse of the few valuables on it. One very nice timepiece and a few Yankee greenbacks. Okay, back to reality for a bit. I actually did roll a guy over to simulate looting the body and damn, I actually did know the guy! Of course, he wasn't really dead and the interchange between us was kind of funny. "Damn! Pete, is that you?" "Hey Chris! How's it going? Looks like your boys won this round." "Yup, but I see your boys have regrouped and seem to want to recover this cannon, very nice by the way. I've gotta run. Nice seeing you. Sorry I shot you man." Off we went, hustling back to our opening position with the "huzzahs" of the enraged northerners chasing us, We turned to make a stand but were swept back into the woods by a sudden charge. There we licked our wounds and prepared for what we knew would be a last gasp effort. Okay, that bit actually happened, we'd been briefed on all this. Rebs would advance, seize the guns, then be routed and swept from the field. We were supposed to regroup and then advance one more time to go down in gory defeat. The Union is saved, huzzah, huzzah, etc., etc. But we were young, we were obstreperous, and not really amenable to discipline. So we decided to freelance. Just a bit. Which set the rest of us off. "Fire truck you Babe Ruth!" At which point a Yankee sergeant, not the guy Steve had "cut down," but a different one, came storming into the woods and wanted to know, "Just what the fire truck do you idiots think you're doing!?!?!? Are you trying to ruin the whole event?!?!" Fortunately we were out of sight of the spectators but we were (once again) upsetting the organizers of a reenactment. The fellow calmed down a bit and admitted that what we were doing was kind of funny but would we please "knock it the fire truck off" and get back on script. We came out of the forest and reformed our lines, our strength much diminished. Forming quickly, we advanced once more. Shot and shell assailed our ranks, we tried to ignore that fire which stormed around us, dropping many a fine Southern soldier to the ground. "10th Mississippi! HALT! FIX BAYONETS!" "10th Mississippi! FORWARD... HARCH!! DOUBLE TIME... HARCH!!!" I bellowed out, "Let's give 'em a Rebel yell boys, and cold Mississippi steel!!!" 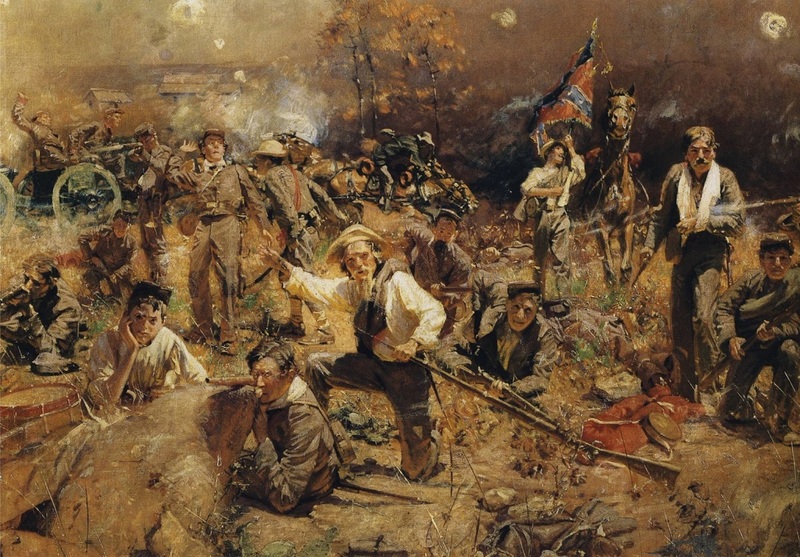 With a howling screech, the 10th Mississippi Volunteer Infantry advanced with the long, loping stride which had characterized Stonewall Jackson's "foot cavalry" in the Shenandoah Valley. A few Yankees actually began to run, but not enough. "16th New Hampshire! PRESENT! FIRE!!!!!!" The volley put much of the 10th Mississippi down, the few of us still standing kept charging but were overwhelmed by Yankee numbers. We went down fighting, but we went down. When the battle was over, not one man from the 10th was still standing. All lay on the field where we had fallen. And that my friends, was the Last Stand of the 10th Mississippi Volunteer Infantry. I was there. Yup, it was our last Civil War (WBtS or WoNA if'n you prefer) reenactment. The bicentennial of the Revolution was approaching, this was probably around 1974, and a number of us were thinking of switching over to reenact that war. I had my eyes on the bearskin caps of the 23rd Royal Welsh Fusiliers, which I've mentioned before. But real life intervened and I didn't really see myself working in a factory for the rest of my life in a small town in Vermont. The U.S. Air Force eventually beckoned, and I spent 24 years wearing a different uniform altogether. But hey, those folks paid me, trained me, fed me, clothed me, and housed me. Later on they even sent me off to college (another story waiting in the wings to be related, someday). There is absolutely no truth to the old rumor that the members of the 10th had been declared persona non grata at reenactments in the New England area. No truth at all. Well, maybe a little. We were rapscallions on our best days and pretty irrepressible most of the time. The folly of youth. But it was a long, long time ago. Ain't no fun at all in being in a revolution if'n you cain't be revolting from time to time. Hoist up the Bonnie Blue Flag and tell them Damn Yankees you don't give a hoot what the script calls for, this time the South is gonna win! LOL at the 'fire truck'.....yep, our general would have had you guys doing picket duty for the rest of the weekend!! And we would have deserved it. More and more I refer to The War Against Southron Independence as 'The War of 1861" to avoid getting people's knickers in a twist. Plus I like the puzzled looks on their faces when I say it. Rebelled at European culture and came to America, rebelled at King George's tax plan and created the USA, rebelled against Mexico's hold on Texas, created the Texas Republic, rebelled against the Morrill Tariff Act et. al. and.... that didn't go so well.... But our folks have been rebelling against unjust causes forever!! We never did any reenactments, just practiced guerrilla warfare. My CivWar reenactor friends said the local groups did both re-enactments (no matter how hard the Union tries, the South is going to always win the Battle of Olustee) and maneuvers, which are glorified war games. No scripting, just rules over 'kills' and such. Yeah, scripting is okay for historical demonstrations, but for ad hoc battles I like the "just go at it" thing. Anton Roessler (Rössler) was my maternal grandmother's grandfather. He immigrated from Hungary as a young man. Fascinating. He had a nice hand. Sarge, I'd never heard about the Southerners turning the 'USA' buckles upside-down. Thanks for the new bit of knowledge! Well in reality, you have to flip the whole belt around.